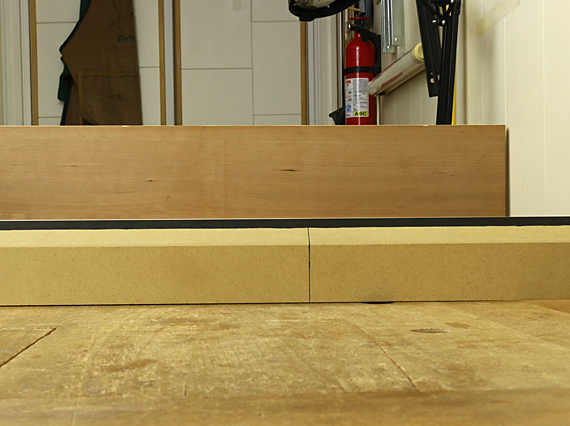 You square the blade to the table saw surface – the setup. Looks perfect; you swear it does. But the workpiece is what matters – the outcome. So you take some test cuts, only to be swearing again, this time in a different way. What going on? Well, your thinking is right. It is best to work as directly as possible. Assessing the test cuts is closer to the actual goal, which is to make a square edge on a piece of wood so it will fulfill its role in the project. The squareness of the table saw blade is one step removed from that goal. Another advantage of relying primarily on outcome is that sometimes the error assessment can be magnified. 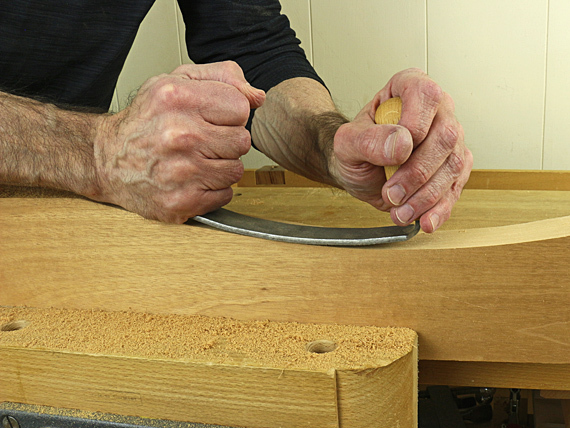 Testing a crosscut for square is an example. The error can be doubled by pairing two cut ends together, or quadrupled by crosscutting around a rectangle. In theory, a good setup should yield a predictable outcome. As Yogi Berra said, “In theory there is no difference between theory and practice. In practice there is.” Gremlins lurk in the table saw example and in nearly all such matters in the shop. Sometimes decent accuracy can seem impossible to achieve. Table/surface flatness. There should be no dishing, no bumps, and no twist. Any defects should hopefully be where they do not matter. Fence flatness. Fences need to be straight, but also without twist. Arbor alignment and runout. The rotating part has to run true. 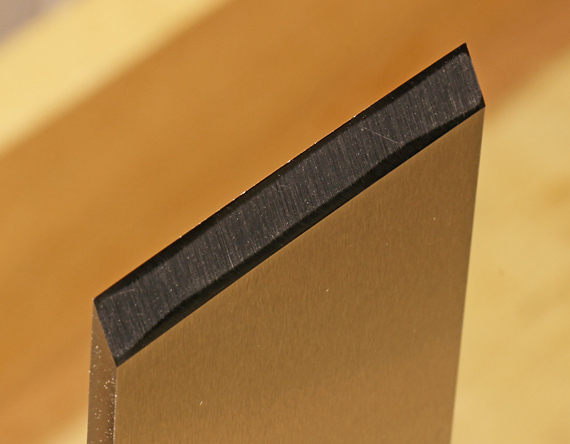 In the simple table saw example discussed above, perhaps you squared the blade from the left side, but rip cuts performed on the right side are a bit out of square. Check if the table is flat. 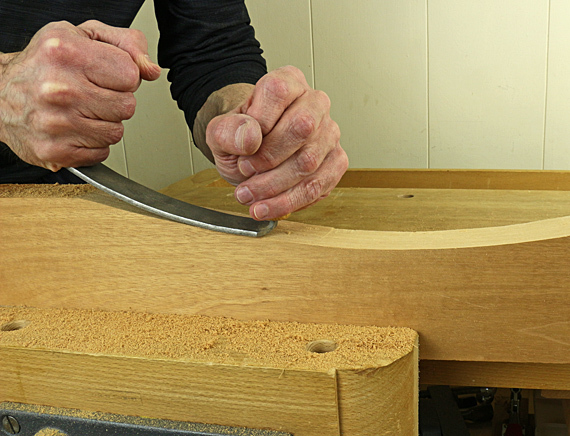 As another example, imagine the error stacking that can result if jointer tables are twisted and/or bowed. Looking at that list of three key factors, unfortunately, they are things that you cannot correct easily, if at all. What’s the answer? Buy the best quality tools you can afford, and check them for good bones. That’s where cheap stuff usually falls short. Of course, other factors come into play but without these basics in order, it will be rough going. Do not be distracted by cute features that are added to make tools sell. There’s one more issue. When trying to produce accuracy based on outcome assessment, it may be difficult to quantify the adjustments needed to alter that outcome. In other words, how much of a change in the setup will result in how much change in outcome? This happens a lot with the bandsaw. Sometimes trial and error is the best you can do. Sometimes it’s best to make the setup as good as you can and just go with that. 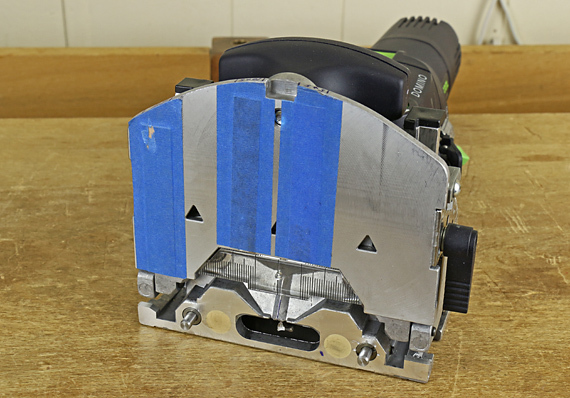 An example would be making the table saw slot parallel with the blade. Recognize the difference between setup accuracy and outcome accuracy. Be cognizant of the multiple factors that may affect outcome accuracy. Be aware of the common culprits. Remember too, you’re going for excellence, not perfection. As with any tool, especially a simple one, winding sticks must be used correctly to gain their full value. Place the darker stick on the near end of the board or surface in question, and the white stick parallel to it on far end. Shine diffuse light on the far stick to improve the visual contrast between it and the darker near stick. Understanding some basic optics can help you use winding sticks with ease and precision that you may not have thought possible. On this, I can speak with special expertise, but here are the basics that matter. Regardless of the optical status of your eyes, it is impossible to simultaneously maintain a clear focus on the near and far stick, unless they are both within the “depth of field.” Think of depth of field as simply the range – how close to how far – where things are in acceptably clear focus. You want both sticks in focus (i.e., within the depth of field) so you can compare their top edges. Therefore, you want to make that depth of field large. Just as with a camera, do this by using a small viewing aperture (i.e. the hole you look through), and/or don’t position yourself too close to the nearest object (in this case, the near stick). Position yourself at least a couple of feet back from the near stick. This will give you a better chance to get both sticks within your eye’s depth of field. (For many reasons, this varies from person to person, and with viewing conditions.) Experiment, but avoid getting right up to the near stick. Artificially make your viewing aperture very small by viewing the sticks through pinholes. This is usually described in other sources as viewing through a single pinhole. This does not work well because your view is not wide enough to see the full width of the sticks, forcing you to move your head side to side to see them. The inevitable inaccuracy in this movement will degrade the assessment of twist. Instead, use a trick that I have been using for decades, and also published ten years ago in Woodworking magazine (an excellent publication that has long since folded). Get your face to the level of the sticks. Hold the row of holes horizontally up to your eye, and sight the sticks. The rectangular shape of the tool will help you orient the row correctly. Both sticks will be in clear focus, and you can view their full widths. It is quite surprising once you see it. Using the pinhole technique is easy and quick. It is very helpful for woodworking where accuracy is important, and, I think it is essential for assessing reference surfaces such as jointer tables. 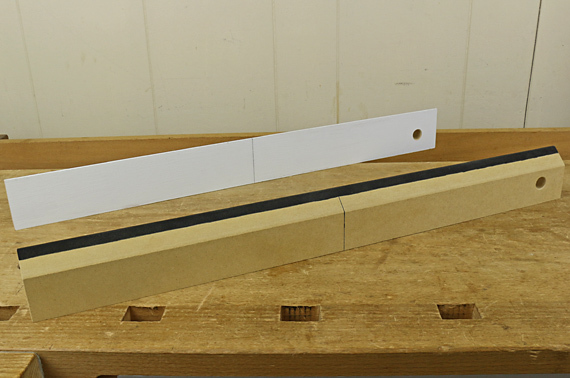 You can test your system for accuracy by placing thin shims under one stick, near its end. Depending on your setup, you’ll probably be able to detect a difference between one side of the sticks and the other side of .006″, maybe better. The approach to winding sticks that I’ve described in this and the previous post is a good example of using a simple tool well. Twisted boards and twisted work surfaces can thwart accurate woodworking as surely as twisted logic. 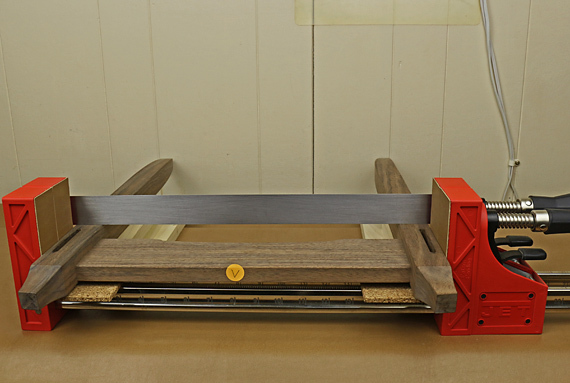 You can test small pieces for twist, such as a small door frame, by simply placing it on a verifiably flat surface such as your table saw top, jointer bed, or workbench. Press or tap on diagonally opposite corners, and look and listen for rocking. Of course, those reference work surfaces must first be vetted. And that method is impractical for larger pieces. You cannot reliably detect twist with only a single straightedge, and so you need winding sticks in the shop. These are simply two sticks, one placed at the near end of a board, the other at the far end. You position yourself back from the near stick and sight along the top edges of the sticks to see whether they are in the same plane, and thus detect any twist in the surface of the board. Let’s explore this essential tool, starting with building it. I prefer to keep this tool simple and functional, without adornment. You can find many variations, such as those with elegant inlay or cute little windows. If you want to gussy them up, go for it, but keep the fundamental requirements in mind. 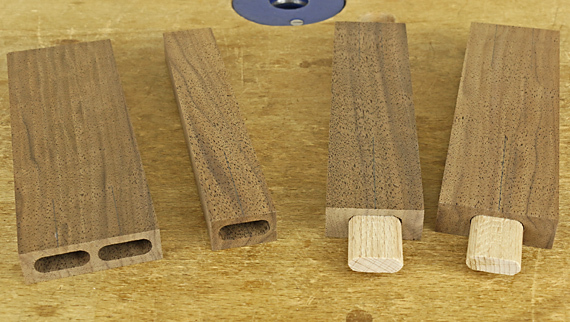 2 – 2 1/2″ is a decent width for the sticks, and they should be thick enough – say 3/4″ – to stand on edge reasonably stably. Chamfer the top edges to about 3/32″-thick for easier sighting. Stable, quartersawn wood is a good material. For length, 12″ is too short – it won’t adequately magnify the twist error. Much beyond about two feet long and it gets harder to scan your sight side-to-side to the ends. My 21″ winding sticks work well for my mostly small to medium-sized furniture making. They used to be longer. If you work with big slabs, make big winding sticks. Long ago, I made what I thought would be a quick version, but I have been using them ever since. 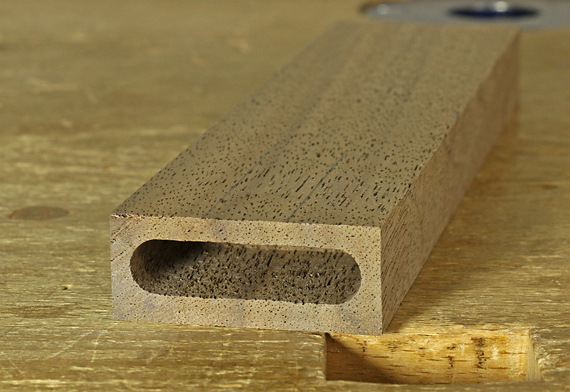 I simply ripped 3/4″ MDF, and with a little tweaking, brought the edges straight and parallel to less than .002″ tolerance. This is a visual tool, so it is necessary to create obvious contrast between the two sticks at their top edges. I painted one white to use as the far stick, and used a Sharpie marker to blacken the area around the top edge of the near stick. If you want to use holly and walnut inlay, enjoy. Some woodworkers prefer to mark incrementally spaced lines, say 1/16″ -1/8″ apart, on each end on the rear stick near its top edge. The idea is to quantify the twist error. I prefer to leave the rear stick unmarked and work more intuitively. I also find that the clean white background avoids the visual confusion of the lines. I suggest experimenting to see what you prefer. In the next post, I’ll cover methods of use, including a nifty trick, refined in a way that I don’t think you’ll read about from other sources. Gluing up is the culmination of lots of work. It’s also exciting in that the piece is beginning to take shape and look like itself. However, it carries with it a potentially intimidating finality, and the process is strictly time limited. This is the time to leave nothing to chance – summon your inner control freak. I cannot think of everything in advance for a unique project at hand, and I doubt you will be able to either. That’s why a Glue Up Rehearsal is essential to ensure success. Hide glue aficionados will point out its extended open and closed times, and potential for reversibility, but still, there are limitations. As you rehearse the process, you will fashion answers to questions and dilemmas such as the following. How exactly will you apply and spread the glue? How will you support the parts for this? Can you finish the glue application before there is any chance of it skinning over before the parts are joined? You dripped a big blob of glue – what, exactly, will you wipe it up with? A big question: would things go better if the assembly were glued up in stages rather than all at once? 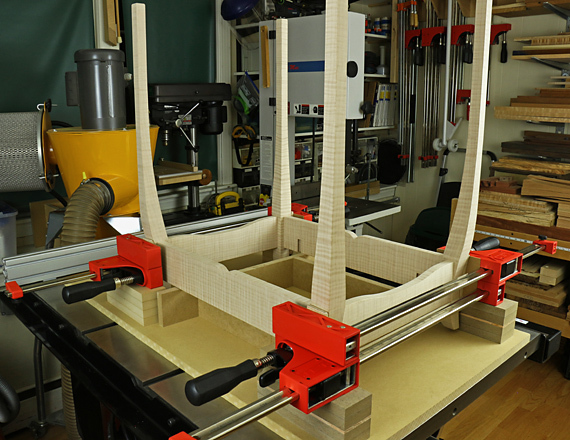 What is a convenient opening to preset the clamps? In what order will you apply the clamps? How will you keep the parts aligned? 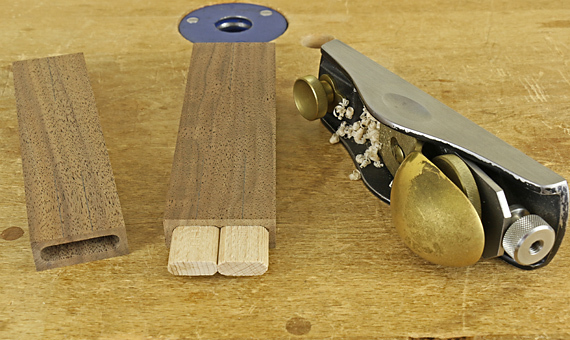 How will you support the pieces in the intermediate stages of the glue up? Will the all of the clamp handles be accessible for tightening? Will you have visual access to see if the joints are closing satisfactorily? Do you need a hand light? Another big question: how will you assess alignment and squareness, and how will you make corrections as needed? How will you deal with squeeze out, and when? 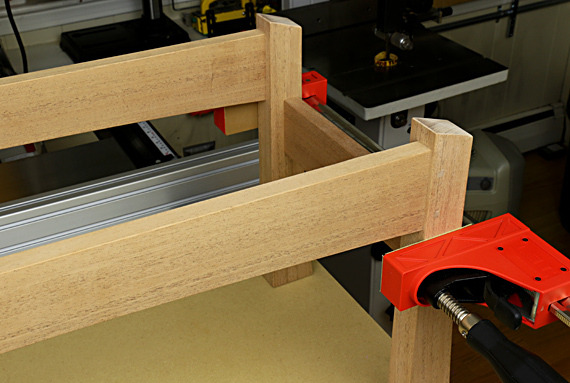 How and where will you move the assembly after clamping? It is almost always worth it to build special support structures if they will facilitate the process. The unconventional leg-and-apron assembly in the top photo required a two-stage assembly and special support structures to ensure that all my previous hard work would pay off in a good assembly. And so forth. The point is that there are surely more questions than one is likely to think of. A rehearsal, albeit a dry rehearsal, along with thought and experience, will cause these issues to become apparent so you can prepare for them. 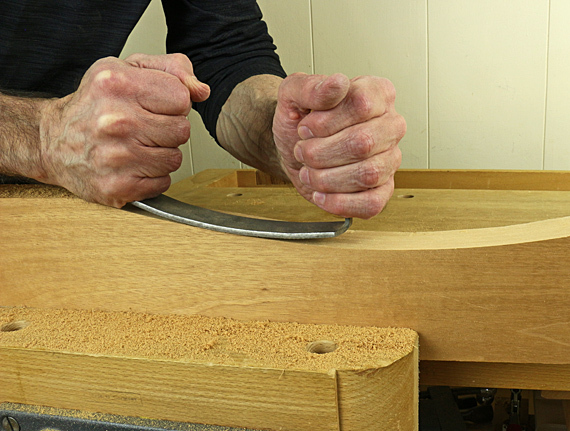 Glue up is game time, but you want no doubt as to the outcome. Rehearse victory. 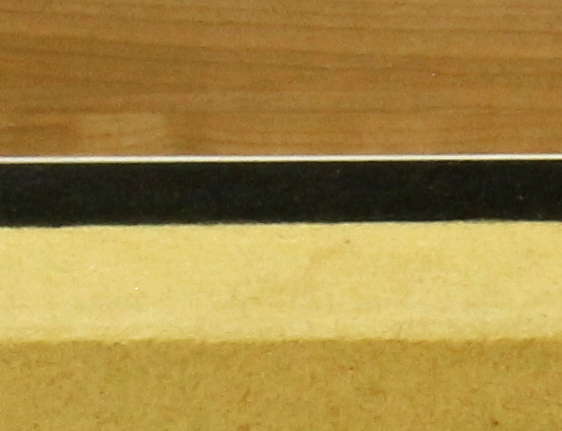 A strip of 0.020″-thick plastic shim stock, about 1/2″-wide and the full length of the stone, facilitates the Ruler Trick. 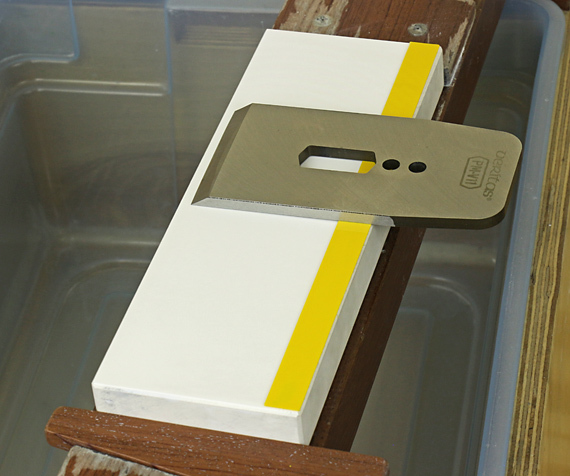 The plastic is the same thickness and width as the 6″ steel ruler I had been using, but the blade slides on it more smoothly, and it allows use of the full length of the stone. 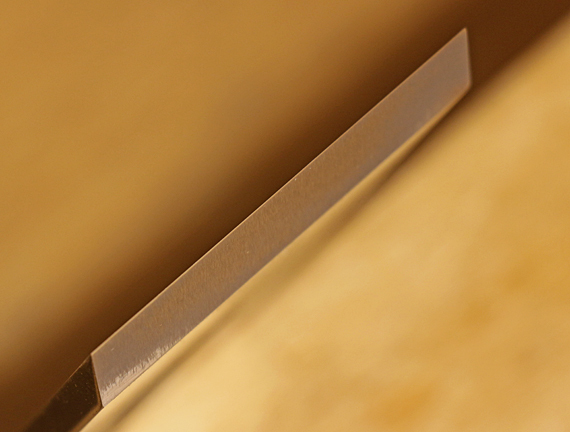 I lightly and uniformly scuffed the bottom of the plastic with 80-grit sandpaper, stroking perpendicular to the direction of the blade motion used in executing the ruler trick. I used fine sandpaper to soften the corners of the long edges of the plastic where the top meets the sides. This preparation, plus the low friction of steel on plastic, makes this plastic “ruler” surprisingly stable on the stone. 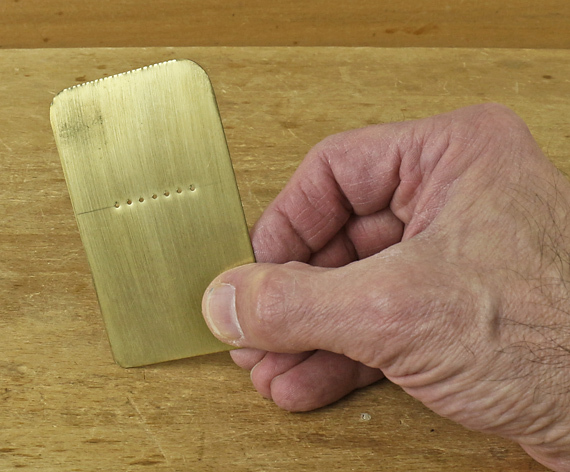 The Ruler Trick, taught by David Charlesworth, removes the “wear bevel” of a plane blade with greater speed and accuracy than by working the back of the blade fully flat against the stone. In other words, it helps in the necessary task of accurately creating two planes of steel that meet at a sharp edge. 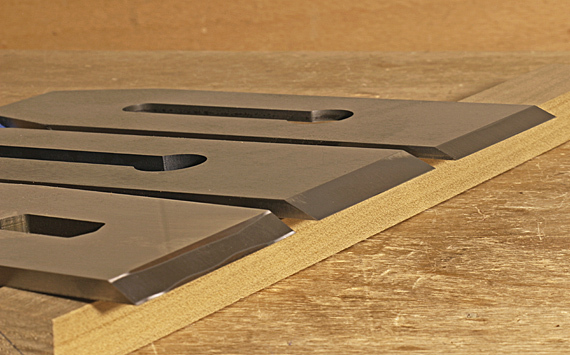 It is useful for nearly all plane blades but particularly valuable, almost essential, for bevel-up blades. 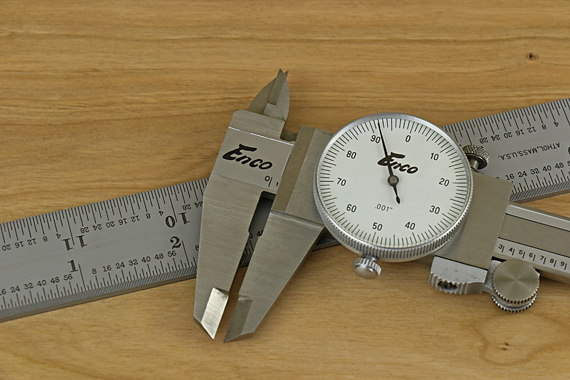 With the blade elevated on one side of the stone by 0.020″ and the edge reaching 2″ across the stone from the inner edge of the plastic “ruler,” an angle of only about 1/2° is created on the “flat” side of the blade. [tan-1 (0.020/2) = 0.57°] This amount has no significant effect on the bevel angle of the blade, nor on the attack and clearance angles of bevel-up and bevel-down planes. The facet is very narrow, perhaps 1/32″-wide, created with just a few strokes on only the finest stone. [Addendum, February 14, 2018, updated: I received the April, 2018 (#238) electronic issue of Popular Woodworking magazine today, and note in the “Tricks of the Trade” section on page 12, a reader contributed essentially the same “trick” to the magazine as I have described here on my blog. He used plastic from a milk jug. His trick also appeared in the November 2016 PW.